The Eleaf iJust X AIO Kit 3000mAh is a new and innovative Kit from Eleaf. The Kit uses the latest One-piece design with a built-in Tank and a 3000mAh battery. Black and silver are available now. The Eleaf iJust X AIO Kit 3000mAh is a new and innovative Kit from Eleaf. The Kit uses the latest One-piece design with a built-in Tank and a 3000mAh battery. The Eleaf iJust X has a convenient top fill tank with huge 7ml capacity that allows you to easily fill large volumes of smoke liquid, so that it can provide you maximum smoking satisfaction. At the same time, it is also equipped with Innovative and leak-proof liquid inlet system, you do not have to worry about liquid leakage any more. The design of the Eleaf iJust X is very stylish and very easy to carry, so you can always carry it wherever you go. Black and silver are available now. 1. First drip a few drops of e-liquids directly into the coil to make it fully saturated before first use. 2. Unscrew the bottom base, screw the primed atomizer head onto the base tightly, and then screw the base with head onto the device tightly. 3. Unscrew the top cap, slowly fill e-liquid into the tank through the side slot, and then screw the top cap back tightly until it could not be tightened further. 4. Finally put the mouthpiece on and the iJust X is ready to use. Power on/ off: Press the button 5 times in quick succession within 2 seconds, the indicator light is blue and flashes 5 times to show the device is powered on. In the same way, it can also be turned off. Protections: Atomizer protection/ Short circuit protection/ low voltage protection/ Resistance detect/ Battery level indication. • You can buy Eleaf EC coils 0.3ohm/0.5ohm. • Warm Reminder: We highly recommend you to use it with e-juice of high VG concentration(no less than 70%). 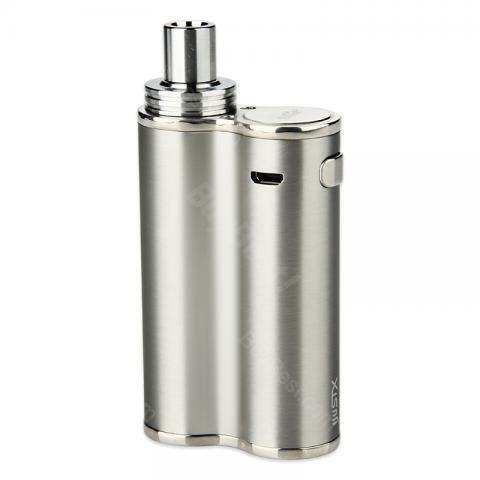 Eleaf is the latest popular e-cig brand, this iJust X AIO Kit also not let me disappointed! Die Eleaf ist SUPER es geht schneller wenn man sich an Sie gewöhnt hat Nach 3 Hülsen hatte ich den Dreh raus ICH KANN SIE NUR WEITER empfehlen wenn Sie jetzt noch lange geht ist alles gut.